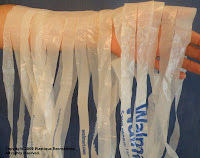 There are multiple strip methods you can use to make and connect plarn (plastic yarn) strips. The 3 methods I'm aware of are - 1) Double-Strand; 2) Continuous (Single-Strand) Strip and 3) Connecting Strip. Tip: Any of the strip methods can also be used with fabric; t-shirts, etc..
Tutorial for cutting a Continuous (Single-Strand) Strip:Lay the bag out flat, straightening out the straps. Fold bag in half (folding bottom up to be even with the top) matching up the handles then a couple more times for easier cutting. Cut straps off right at the base of the straps and cut off bottom seam of bag. Just a sliver is all that is needed. 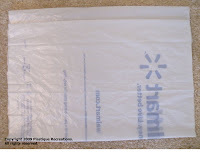 Put your hand through the middle of the bag to pull it apart and lay flat as a tube. Fold this tube to within 1 inch from the top (I call the main fold the spine). Continue the fold multiple times until your tube is small enough to make one cut. You’ll cut from the bottom to the top of the initial fold – not through the spine. Determining the width of you’re the strip is based on the needs your for your pattern. The rule of thumb is not less than 1”, 1 1/2 to 2” pieces are typical cut sizes. Straighten out the strips – it almost looks like tentacles. Here comes the fun part – separate the strips by separating it at the spine. You can either lay it out on a flat surface or use one of your arms (I use the arm way which is why I'm suggesting it). To use your arm, take one hand at the beginning of the spine and separate each half. Whether you lay it out on a flat surface or use your arm - to begin cutting place your scissors on the bottom half of the spine, angle your scissors in an upward motion to the next section over and cut. Continue cutting until you reach the other end. You should have a pile of one single continuous strip. The easiest way I have found to make a ball is put your pointer and middle fingers together. Place the end of the strip between the fingers and begin wrapping the strips around both fingers about 5 times. Then pull off the fingers and begin wrapping the strips around it. Before you know it, your ball begins to take shape. I just found this. I'd love to try it, if I ever find some spare time. Great directions. The single strip cutting had eluded me. Tried crocheting a bag before, but cut my strips way way to thin. Will now be revisiting that! I have printed out your instructions for Harn, Parn, and Jarn for my daughter. She only took one big crochet hook to Kenya for her tour in the Peace Corps. Thank you SO MUCH for this tutorial! I've looked at several written and they were clear as mud. I'm not sure those people knew what they were doing. One lady on video was not only terrible at speaking & camera-work but told us to cut at the wrong places. So again thank you! Thankyou for this tutorial. Wish I had seen it a week ago! I just made a lot of yarn from old t-shirts, and didn't know any clever way to cut it. I shall try this method next time. Thank you for sharing, your instructions are not clear as a bell. The above comment was to say as clear as a bell, don't know where the not came from. Hello, wonderful idea. But I don't quite understand. Could you make a quick video to show how you do it? Best way is to TRY it! I got it right on first try. You cut the strips apart, but you are cutting on the diagonal, at the top (as shown), one row at a time so they stay in one continuous piece. If you make a mistake, try again on another bag. 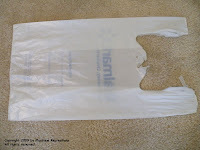 How do you connect the strips from one bag to the next? Excellent question - Most of the time I tie they together. If I am making the item as part of a purchased order, I will use my iron and fuse the pieces together giving a seamless appearance. Thanks for visiting. I love the continuous strip idea! I have an awesome project for plarn! I'll share when I finish the first one. Thanks for sharing!